DesignerCon (aka DCON), the west coast’s premier convention for fans and creators of cutting-edge collectible art and design. Now in its eleventh year, DCON is November 19-20 in Pasadena, California and will feature over 350 artists and designers selling limited edition and exclusive toys, art prints, and apparel items. 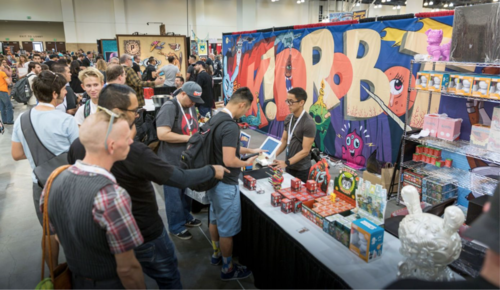 This year over 20,000 fans and families will attend DCON to buy world-class, cutting-edge art and related merchandise from renowned artists and brands such as Greg “CRAOLA” Simkins, Huck Gee, KidRobot, Tara McPherson, Buff Monster, Toygami, Luke Chueh, Junko Mizuno, Frank Kozik, Joe Ledbetter, Jeff Soto, and many, many more. New this year, DesignerCon has partnered with Los Angeles-based creative agency Crewest Studio (aka Crewest) to grow the show by adding exciting new programming with speakers, panels, and the official opening night party featuring legendary DJ Z-Trip at The Rose in Pasadena. Founded in 2006, DesignerCon brings together artists, manufacturers, distributors, and retailers in the designer toy/vinyl collectibles market and has grown over the last ten years to incorporate everything in the design world including apparel, plush, printing, sculpture, designer toys, and both fine and urban art. The steady growth DesignerCon has enjoyed correlates with its popularity in today’s art nerd, geek culture; collectors and designer toy lovers alike wait through the night for new releases, pre-orders for new artist collaboration apparel are sold out within minutes, and artists use the convention as an opportunity to announce exclusive releases and collaborations. The growth and popularity of DesignerCon has spawned a new partnership with Crewest Studio in Los Angeles who will be introducing new programming, including the first official party on opening night with DJ Z-Trip and a Secret Wall art battle. Crewest is a global leader in contemporary art and culture media. As a creative agency, Crewest uses cutting-edge creativity, art, and design to inform, inspire, and entertain. Established in 2002 as the groundbreaking art gallery in Los Angeles, Crewest’s mission is the same: open minds, raise consciousness, and drive culture. Comprised of creators, arbiters, and curators of contemporary culture, the LLC was co-founded by Scott Power and Man One. Their dedication to their mission is apparent in the lineup at DesignerCo 2016. At the opening night party on Saturday, DJ Z-Trip will headline the entertainment performing at 9:30pm. DJ Z-Trip has won “America’s Best DJ” award, toured the globe, and has collaborated with LL Cool J, Nas, Public Enemy, DJ Shadow, Bassnectar, Talib Kweli, and even Shepard Fairey. Before DJ Z-Trip performs, Secret Walls will entertain the crowd with their unique live art battle featuring live art competition with artists TooFly, Kano, Juan Muniez, Das Frank, L’Amour Suprim, and Skinner using only Sharpie markers and black and white colors. Hosted by Greg Mishka, Secret Walls is an unparalleled live illustration battle not to be missed. 355 vendors at DesignerCon means there’s something for everyone; vendors include galleries, toy designers, fine artists, and apparel companies such as Crewest, Munky King, Yesterdays, Kidrobot, 3D Retro, Alex Pardee, Daniel Rolnik Gallery, La Luz de Jesus, Pretty in Plastic, and Paul Frank to name a few. Many participants will also be releasing exclusive goods. DJ Z-Tri will be signing gear in the Crewest Booth (1808) Saturday, November 19 at 3pm.